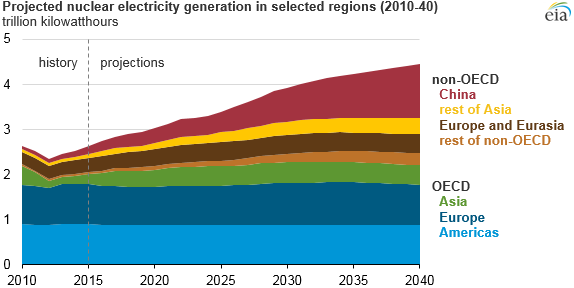 EIA's International Energy Outlook 2016 (IEO2016) projects that total global nuclear generation will increase by 73% through 2040, from 2.6 trillion kilowatthours in 2015 to 4.5 trillion kilowatthours in 2040. Countries that are not a part of the Organization for Economic Cooperation and Development (non-OECD countries) account for 86% of this increase, with China alone making up more than 54% of total growth. China's growing nuclear fleet is expected to produce more than 1.2 trillion kilowatthours of electricity annually by 2040. As of 2015, China had 34 operating nuclear reactors, with a total capacity of 27 gigawatts (GW). To meet its growing electricity demand and to address environmental concerns, China has implemented a long-term strategy for nuclear power development. According to the International Atomic Energy Agency, between 2010 and 2014, China added 10 nuclear reactors, totaling 18 GW of additional capacity. The resulting increase in nuclear generation of 53 billion kilowatthours accounted for 79% of the increase in nuclear generation in all non-OECD countries over that period. China has an additional 20 reactors under construction, which, if completed, will add more than 22 GW to its existing capacity. At China's current construction rate, one reactor comes online every five months. According to both China's State Power Investment Corporation (SPI) and the World Nuclear Association's assessment of China's 13th Five-Year Plan, unveiled in March 2016, the Chinese Energy Fund Committee is expected to approve six to eight new nuclear reactors each year through 2020. This represents an additional 34 to 45 GW, increasing China's nuclear capacity to nearly 90 GW by 2025. By 2032, China is expected to surpass the United States as the country with the most electricity generation from nuclear power. In addition to China's need to meet increasing electricity demand, China's nuclear strategy helps to address environmental concerns. China is currently the world's largest emitter of energy-related carbon dioxide emissions and the world's largest consumer of coal. Building new nuclear capacity will increase China's ability to meet growing electricity demand without increasing the consumption of fossil fuels associated with carbon dioxide emissions. Nuclear generation in non-OECD Asia (specifically China and India) surpassed OECD Asia (Japan and South Korea) in 2012 after the temporary shutdown of all 54 of Japan's nuclear reactors. Although South Korea is expected to increase its use of nuclear power and Japan is expected to restore some nuclear capacity, few capacity changes in those countries are anticipated after 2020. Meanwhile, nuclear power growth in China and India is expected to continue through 2040, with China dominating growth in the region. Both OECD Europe and OECD Americas (including the United States) are expected to maintain current nuclear generation levels through 2040. By 2028, nuclear generation in non-OECD Asia is expected to exceed both OECD Europe and OECD Americas.